** Group IVA oxyanions have 2- charges instead of the expected 4- ! Why? # Nitrate has a 1- charge instead of the expected 3- ! Why? 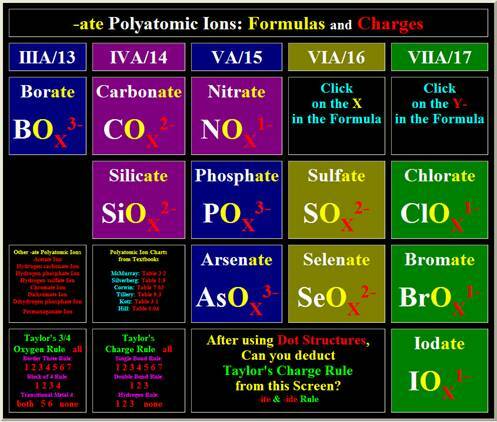 Use the position of the oxyanion on the periodic chart to determine the charge on the –ate Polyatomic Ion. See above! 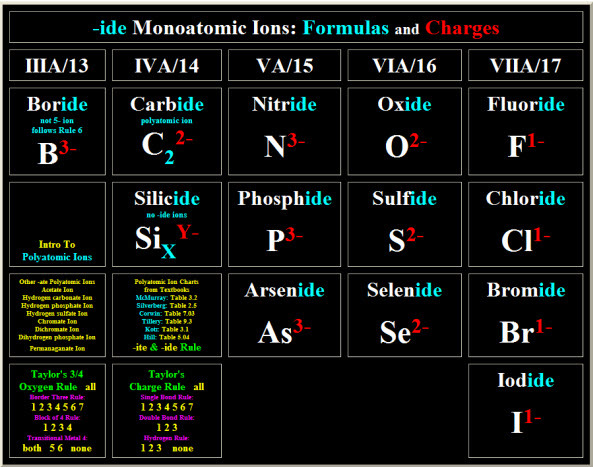 Seven of the Nonmetal oxyanions have the same charge as the charge on the central nonmetals –ide ionic charge. Carbonate, Nitrate, and Silicate have oxyanionic charges that are different from what you would expect if you used the Roman Numeral A Group notation to determine the oxyanion’s charge. Why? Exactly how do the charges compare to what you would expect? Borate is also different because the Boron in Borate does not follow the octet rule. It follows the rules of six so the charge is 3- instead of 5-. If you apply the concept of formal charge, oxidation number, and total valence electrons, the central nonmetal may have ten and twelve electrons utilizing vacant d-orbitals and may add additional double bonds in the dot structures of oxyanions in periods three, four, and five. See below. 4. 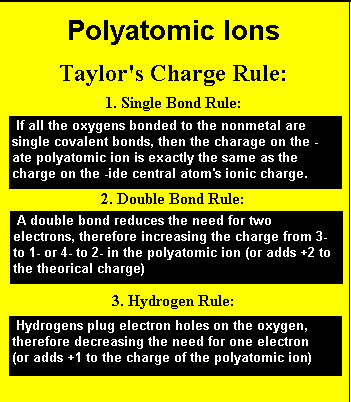 All –ate Transitional Metal Polyatomic Ions have a charge of 2-, except Vanadate which is 3-.